NYC Councilmatic is live, as a non-profit public resource on everything that’s happening in NYC government. Our site includes every committee’s activity and public events, creating unique open data for civic engagement. To highlight issues in the news and priorities in NYC communities, we’re running a monthly comment program with verified NYC Council offices, community groups, and regional news media. One of our December topics for a homepage-featured public comment program will be the “AirBNB bills” on hotel regulations in NYC. Background on apartment-rental / AirBNB in the news: Oct. 30th, 2015 press release on legislative initiatives from Council Member Helen Rosenthal, with CM’s Rodriguez & Levine. Capital New York article that same day on back-and-forth between Housing Cmte. chair CM Jumaane Williams and AirBNB rep Chris Lehane. Brian Lehrer WNYC show held an extensive call-in segment today with Lehane, audio posted later today. BetaNYC discussion thread yesterday on AirBNB’s “release” of data affecting public policy. All three of the below bills in Cmte. on Housing & Buildings have a last action of “laid over” (no action taken) from the Oct. 30th hearing – transcripts and more attachments. The last Housing committee meeting of 2015 was Nov. 12th, no calendar is yet available for 2016 – Councilmatic will have it shortly after it’s published – see below, we’re hoping to build ways for you to be alerted when AirBNB is being discussed. Intro 826, first primary sponsor CM Rosenthal – increases civil penalties from $10k to $50k for each violation. Full text. Comment here. Intro 823, first primary sponsor CM Rodriguez – on increased tracking of illegal conversions of dwelling units. Full text. Has 13 sponsors, one more than Intro 826. Comment here. Intro 788, first primary sponsor CM Levine – an info guide for tenants & owners on obligations. Comment here. Next steps? First, post a comment on NYC Councilmatic bill pages above, e.g. for Intro 826 – we’ll be bringing in community groups, policy experts and regional political reporters. Towards the goal of closing the feedback loop on local issues. Second, contact your council members’ offices with your input, and use this contact form for CM Rosenthal on her site to convey notes to her office on the AirBNB legislation itself (mentioned in a long list without perma-links on her site). You can also find your council members on their new Labs site listing. 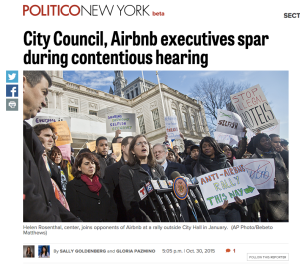 Third, donate to our 501(c)3 non-profit organization so that we can build free alerts for NYC residents and journalists and gov’t professionals to track the AirBNB discussion into next year. Imagine getting an email alert when the next Housing Committee hearing is scheduled, whether these AirBNB bills are on the agenda, and where to go to comment on behalf of your community. Help us develop free alerts for local issues & keywords on NYC Councilmatic, e.g. for hearing agendas. We’re also looking to provide alerts over SMS and social media, so New Yorkers have timely and effective ways to convey their input to the Housing Committee members and other local elected officials (such as Borough Presidents and NY state legislators). Our alerts will be written in open-source code, to be re-usable by more cities, and can be customizable by keyword or issue area or district number (neighborhood) – but we need additional charitable funding support for web development time. We’re working on custom, editorially-created tagging features to make it so that searching “AirBNB bills” from the NYC Councilmatic pulls up the correct information – something we’re doing manually at the moment, but that’s possible with open data (and not designed to happen on the city’s official legislative portal). Connecting journalists and bloggers and watchdogs and neighborhood groups directly to the info they’re searching. Finding a way to help secure PPF a donation, to improve public dialogue about AirBNB in NYC, would be a huge help for our work on local civic engagement. Plus, we have a unique SMS tool for easy public feedback on local issues of importance – support our work in delivering residents’ ideas to city council offices in productive, structured ways. To help us facilitate a donation this month and to discuss more, simply email: david at ppolitics doooot org – read more about where we’re headed for open data and informed cities. Questions & feedback welcome, more to come on December’s public comment program.